You wouldn’t think that a children’s storybook about a bull who would rather smell flowers than fight in an arena would be controversial in any way, and you’d be right except for many countries outside the United States. Published in 1936, The Story of Ferdinand by Munro Leaf became popular in America, but in other countries at the time including Nazi Germany and a Spain that was on the cusp of the Spanish Civil War, it was seen as pacifist propaganda and subsequently banned by those totalitarian authorities, only re-emerging into those respective cultures after the end of the Second World War and, in Spain’s case, after dictator Francisco Franco’s death in 1975. Despite its rocky international appeal, the story remained a classic in American children’s literature, spawning an Oscar-winning animated Disney short, and now a feature-length CGI adventure from Blue Sky Studios. How does the new version stack up against its source material’s legacy? Well, for a story that despite its setbacks has managed to stand the test of time, this is a film that will most likely wander from the memory soon after seeing it. It’s about a bull called Ferdinand (John Cena), who as previously suggested likes to smell flowers more than actually engaging in proper bull-like activities. However, when circumstances cause him to be taken away from his peaceful home, and into a holding pen surrounded by other fighting bulls, he must find a way to get back to where he belongs, or else face the fate of many other bulls before him that have gone into the arena. Like the book it’s based on, it’s a pretty simple story that coasts mainly on the appeal of its innocent and likeable main character, which Cena surprisingly puts a lot of heart into and makes him a charming lead that children can easily follow without hindrance. The animation is nice and colourful, as it usually is with a Blue Sky movie, and the message is an easily digestible one of kindness and gentleness, which again should ensure it plays fairly well with a slightly younger audience. The thing is, though, there’s really not much else to this film. The story is very formulaic and entirely predictable, which even the youngest kids in my audience were picking up on because they were getting way too restless and fidgety to focus on what was happening, and while there are a few fine supporting characters there are many others who are either really annoying comic relief or entirely unnecessary in the grander scheme of this plot. Kate McKinnon, who voices the “calming goat” and go-to annoying sidekick of the movie Lupe, is the biggest culprit of the former, as from her very first few scenes she is an irritating presence whose comedy is really obnoxious and never becomes endearing or even that funny. I have a feeling that she will be a focal point for strong critics of this movie, as will a certain dreadful scene of dancing that sums up everything about why this movie will not have much lasting power with audiences (dabbing horses… that’s all I’ll say for now). Despite, like I said, a fair attempt at a nice message with a charming lead character, this is a pretty mediocre family film which, given that Paddington 2 and Wonder are still likely playing right now, isn’t even the best option to take them to if Star Wars: The Last Jedi is entirely sold out. In terms of Blue Sky films, it’s not as painful to sit through as some of the later Ice Age movies, nor is it as outstandingly sweet and smart as The Peanuts Movie (which to me is probably their best film right now), but it falls right into the same category as a lot of their other films do, which is that of entirely disposable mediocrity that contains something pretty for the eyes to look at, but ultimately offers little for the majority of audiences to really chew on or be truly challenged by. Again, it’s weird that for a story that has stood the test of time, the movie version of it is one that won’t even be remembered a few years after the fact. 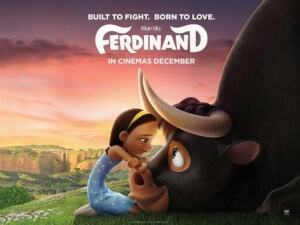 Ferdinand is a well-intentioned but largely mediocre family film which, despite pretty animation and a likeable lead character, falls into the trap of having a formulaic plot, some annoying side-characters, and little else about it to make it stand strong next to the timeless story it is based on.